Come to Tangerine to sample fine Far Eastern Cuisine , choose from the kitchen's signature or classic favorites for a taste of our modern and healthy oriental dishes created by our Thai Chef team. Not to be missed are our Tom Yum Prawns Soup , Young Papaya Salad , Wasabi Prawns, our wide selection of freshly prepared Dim Sums , Steamed Fish with Garlic , Red Chili and Coriander in Lemon Sauce , Beef Rendang , Malaysian Curry Chicken , Nasi Goreng to name just a few. Watch our Chefs prepare your favorites, live from an interactive kitchen which is the main focus of the spacious & well designed Dining Room. Stimulate your senses with the aroma & sounds of the an Authentic Asian Kitchen. Opulent textures, dramatic shapes and the low key glitter of dozens of candles and gilded objects give Tangerine a cozy glamour. This is the place to settle in for fine food, mocktails and some seriously casual conversation. A perfect continuation to the memorable meal would be one of our irresistible deserts, not forgetting a tasting of our specialty teas and coffees, which are a reason to visit in themselves. And just as all good things need to come to an end, walk away from this lovely Oriental paradise, with beautiful memories & a Delivery menu, which promises more of the same, any time anywhere! Tangerine offers home delivery service in most areas in Dubai (a minimum order policy applies at selected locations). Credit card is accepted even for home delivery. Just tell us if you wish to use your credit card when you call in for home delivery and we will send our machine to your home. 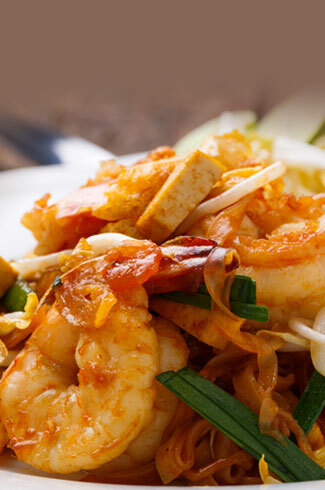 Indulge in the best Authentic Thai and Far Eastern Food in Town.